Okay, are you prepared for some crazy nail art? This isn't just stripes or dots, this is the real deal, even if the thumbs resemble man-eating zombie rats. Kudos for trying, though, right? There is actually a story behind this nail art - as a teenager (I'm 22 now) I had a million guinea pigs, it was actually insane. I loved them to bits, but I am never doing that again - my two I have now are fine for me! I had one that I really loved - he was my first little "squeaker". My neighbour gave him to me when I was about 12, I think, and he lived for about seven years all up. He was so cute! While most guinea pigs go hide when you walk past, Panda would come out and squeak at me, putting his paws up on the cage to say hello. I even painted a picture of him once. 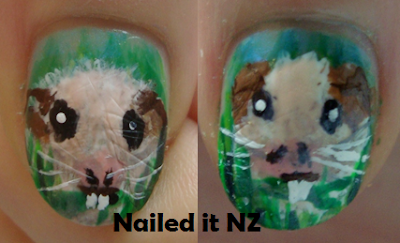 So, it only made sense that eventually I'd have guinea pigs on my fingernails. I think the ones on my fingers turned out okay for the most part, but I am so embarrassed of the thumbs!! 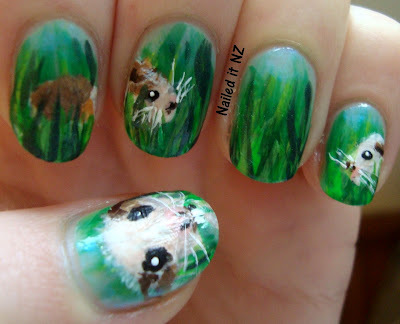 They were meant to be super cute, a little guinea pig chewing on some grass or a flower but no. Oh well. I hope the pictures of them below provides some entertainment, at least :P.
For you people who don't know what a guinea pig is, it's like a hamster, but bigger and different proportions. Still super cute though. Also, I lost my nail art brushes the other day. Never found them. WORST TWO DAYS OF MY LIFE. Thankfully it turned out someone down the road sold them and I got some more quickly (they were due to be replaced anyway). So yay, crisis averted. He was! I miss him! OMG I love these!!! 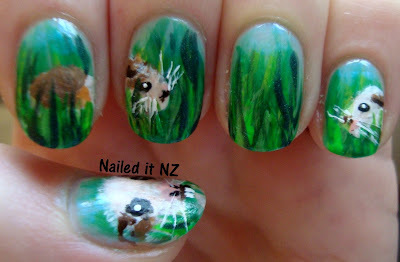 I am guinea pig obsessed! I've got the paw prints of my pigs that are in the giant veggie garden in the sky tattooed on me. I'm going to HAVE to find someone here in the US and where I live who can do this for me no matter the cost! fantastic job.. btw hairless guineas look like man eating zombie rats so still awesome!